Rustic warm gray finish over replicated Oak grain accented with dark charcoal finish over replicated Oak grain. Sleek contemporary handle in a dark gunmetal finish. Cases feature recessed side panels for a contemporary look. 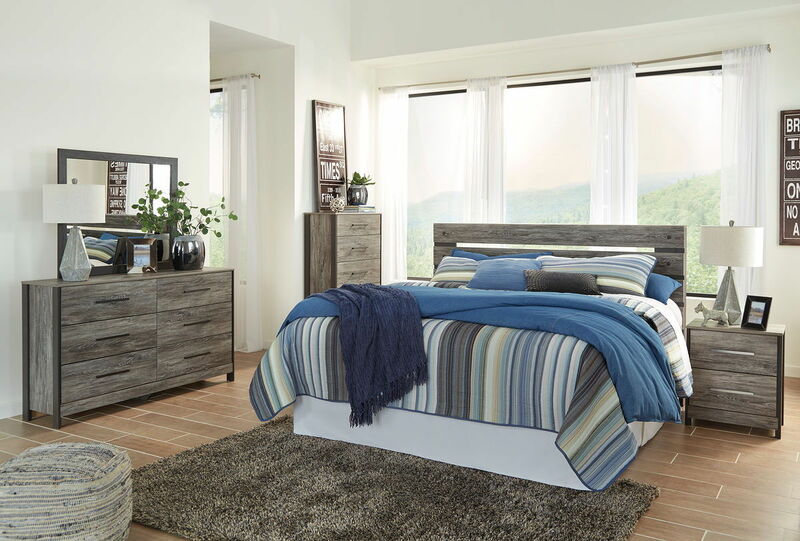 Headboards are designed with an open slat design. Side roller glides for smooth operating drawers. Drawer interiors lined with a faux linen laminate for a clean finished look. Slim USB charger located on the back of the night stand tops. Queen (57) and King (58) headboards can attach to a bolt-on metal bed frame B100-31 or B100-66 respectively.